Use a few pennies and a store bought hair barrette back to make these lovely hair holders. 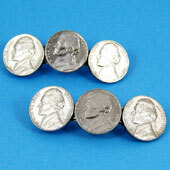 For silver barrettes, use dimes or nickels and mix up the coins for another look. The craft is quick and simple and the results are very attractive! Make a set you yourself and to give as a gift. This project is well suited for family, group or classroom craft time. With a little preparation by the adult or teen leader, this project will go quickly. 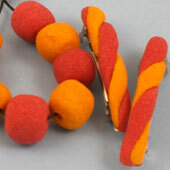 Related craft: You can also make colorful barrettes with Homemade Modeling Dough. Check it out! Gather the materials needed for making the barrettes. If you are doing this project with a group of children, they will enjoy collecting and trading for shiny pennies with family and friends. Tip: It usually takes five pennies for each large hair barrette and three pennies for each smaller barrette. 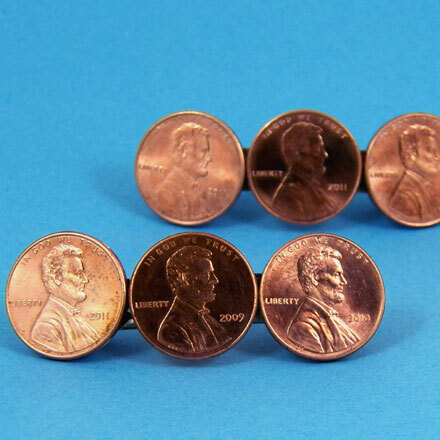 Arrange the pennies as you like on the barrette, then glue them in place one by one. On curved barrettes, you will need to hold the pennies in place until the glue sets up. Use contact cement or other glue meant for adhering metal to metal. Super Glue and E6000 work well, but should only be used by adults. Carefully follow the instructions on the glue. Tip: To keep pennies from sliding off the barrette as the glue dries, place a stack of pennies at either end of the barrette. Let the glue dry completely before using the barrettes. With most glues allow 24 hours for drying. That's it! Enjoy your new shiny barrettes! Thanks to Anne Stein for sharing this craft idea with Aunt Annie's Craft Exchange in 1997. Anne shared, "I enjoy crafts of all kinds; but most of all I enjoy my grandchildren's eyes when they complete a craft that is simple and looks good." Tip: Other coin denominations can be used to make coin barrettes. Related project: It's also fun to make barrettes using Homemade Modeling Dough.